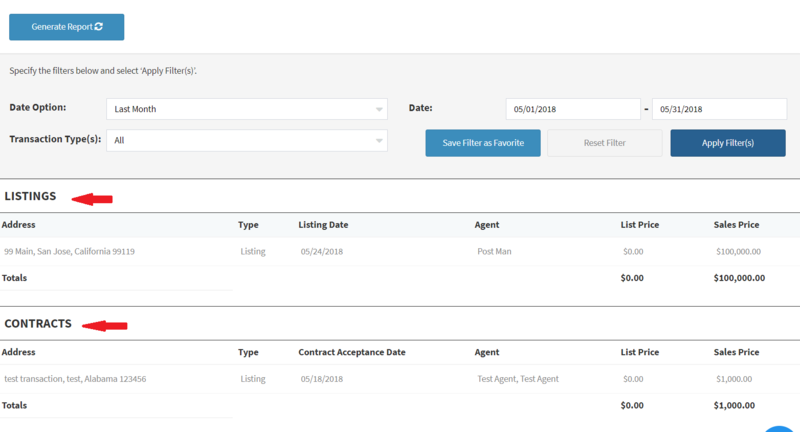 The hotsheet report is used to see your active, closed, under contract, expired and withdrawn deals. The report has the property address, the transaction type, date, agent, list price and sales price. The report can be filter by date ranges or by transaction type. From the filters selected you will see a breakdown of the transaction type selected. You will have a list of Active deals-Includes property address, transaction type, close date, agent, list price and sales price. Under contract deals -Includes property address, transaction type, contract date, agent, list price and sales price. Closed deals-Includes property address, transaction type, close date, agent, list price and sales price. Expired deals-Includes property address, transaction type, expiration date, agent, list price and sales price. Withdrawn deals-Includes property address, transaction type, withdrawn date, agent, list price and sales price. You can generate a report and export it to an excel spreadsheet.